Renowned industrialist and financier Charles Schwab, fresh from the Greenwater Camp, where he lost a sizable investment in a group of copper mines (see Greenwater Heist, posted Aug. ‘09 ), and having had previous success investing at Tonopah, the Nevada bonanza, decided that it was time, once again, to exercise his genius for finding hot gold mining prospects. 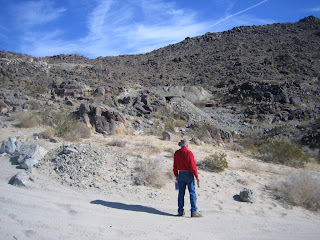 So, shortly after closing the Greenwater Death Valley Copper Mining and Smelting Company, Schwab sent his trusted mining engineer Jack McGee to the Dale Mining District for a look at two prospective mines which had been in litigation for sometime. The Dale Mining District began with the discovery of placer gold around 1883. 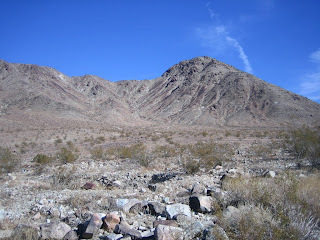 Reports circulated that washes and a dry lake bed, located east of the present town of Twenty-nine Palms, teamed with miners and prospectors sifting through the sand with dry washers and other means of separating out the gold. 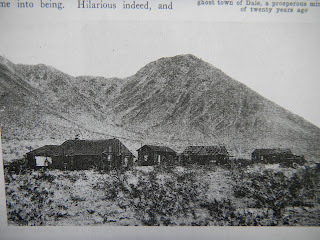 A small community, now called “Old Dale”, formed near a well located at the south end of the dry lake. A post office opened here in 1898 giving the settlement official recognition. At about the same time, the miners got together and formed the Dale Mining District to include the Pinto Mountains and all washes under claim. 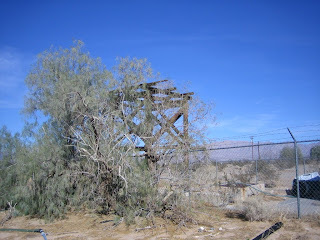 A stamp mill and an arrastra processed some gold ore and a road was built, 30 miles in length, to the railroad siding at Amboy. Mining equipment and supplies were brought in along that road by mule-drawn wagons. Not much was ever recorded about business activity but we can guess that there was at least one saloon, a general store and a few other shacks. The site would have been surrounded by tents, some on the ground and some on wooden floors -- floors that could be moved by wagon to the next find. Soon after the post office arrived at Old Dale, dry-washers gave way to the pick and shovel as men turned to prospecting through the canyons and gulches and up onto the mountain faces and ridges looking for promising gold bearing ledges and quartz lenses and all else that mining men look for. The well, at Old Dale, continued to supply water to the miners first by the barrel and later by pipe. Virginia Dale Mine was the first to open and start producing gold. Workings, typical of that time, included a 250 foot incline shaft with two drifts, a stamp mill on a slab and an assortment of machines and tanks for extracting gold. 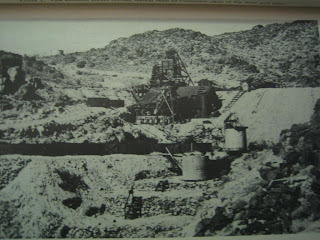 Poor management, disagreements among owners and law suits forced the mine to remain idle most of the time. A correspondent for a mining journal wrote that, in his opinion, owners of the Dale Mine had developed the wrong method of processing the type of ore found there and, if they had studied the problem a little more, they could have avoided the black eye and failure that was now talk of the district. Back rooms of the Shamrock Saloon served as a hotel. The post office moved up from Old Dale in 1903 and brought news of the outside world. The district was over one-hundred miles from any sizable community and unknown to even the Supervisors of the San Bernardino County. Upon returning from a visit to the mines, one supervisor claimed he had no idea that such a prosperous camp existed and proposed that the county build a road out that way which eventually they did. Mine workers lived at the mines and came into town on payday. They came to drink and gamble, get a haircut and visit with the ladies. A few saloon fights would happen now and then but things were generally peaceful -- except on one occasion. Charlie Thomas, a miner and general troublemaker, had his mind on a $400 gold brick that he knew was stored in the post office to be shipped out the next day. He managed to corral some locals milling around town and ordered them at gun point to march down to the post office. They were somehow going to help him steal that gold brick. Joe Wagner, the local constable, happened to be in the group. He was unarmed having temporarily left his gun at the post office. A friend whispered in his ear, “Joe you better get in there and get your gun”. As the story goes, when they got close to the post office, Wagner crashed through the door grabbed his gun turned and fired through the window instantly killing Charlie Thomas to the relief of everyone. At the coroner’s inquest Charlie’s death was ruled justifiable. His grave is one of two in the district. This version of the story differs from the one usually told. Some writers claim that there were three communities called Dale – Old Dale, New Dale and a third, Virginia Dale, located at the Virginia Dale mine. I prefer to recognize only the first two, Old and New Dale. The post office serving the district arrived at Old Dale in 1898 and was moved to New Dale in ’03. It remained there until it closed on October 30, 1915. There was a small camp at the Virginia Dale Mine populated mainly by the men who worked there. The 1910 State Mining Register noted that there were 35 lode (hard rock) mines in the district; twenty-three gold, eleven copper, and one iron. In addition to the Virginia Dale, there were four other mines that left footprints on the east side of the range. They were the ones with opened shafts and tunnels and the ones that processed ore on-site in sizable amounts. OK Mine, comprised of two 800 foot incline shafts in contact with a quartz monzonite vein two to six feet in width, produced a little less than a troy ounce of gold per ton. The mine featured a ten stamp mill. Ivanhoe Mine claimed a number of valuable properties along with a quarts vein that averaged 1 ½ troy ounces of gold per ton. Workings included a number of shafts and tunnels and a dry concentration plant. Charles Schwab leased the Supply-Nightingale Mine and renamed it United Greenwater Copper Company. The main shaft was deepened to a depth of over 1200 feet. The mills were expanded and over half a million dollars in gold was recovered. But, as mentioned, problems with water seepage raised milling costs that could not be covered by the current price of gold and the mines were closed. Schwab and his investors may have actually made some money. If so, they were the only ones in this district that did. Production in the district peaked near the turn of the century and then faltered as the ’07 recession deepened. A short revival of production occurred in the mid-teens as a result of new discoveries. During the depression years of the ‘30s, some mine dumps and tailing piles of abandoned mines were scavenged by unemployed “scratch miners”. The Supply-Nightingale Mine was the only operating property during the period from 1930 to 1942. The rugged Pinto Mountains, with their deep canyons and lofty gold bearing ledges provided the ideal perch for the hard-rock miner and his grinders, separators, shakers and amalgamators, features that lent interest to the surrounding picturesque landscape. And now, unfortunately for us, the tall hoists, buildings and settling tanks are gone, hauled away over the years, leaving us with their platforms, covered shafts and tunnels and the white powdery tailings that fall away from where the reduction of ore once took place. Still, a trip through these colorful canyons is worth a day’s adventure as you can see from the photos that I recently took.